Unveiling a powerful and proven methodology for teens and young adults with ADHD, this guidebook offers complete instruction for professionals and parents on what ADHD coaching for young people is and how it can dramatically improve the lives of the afflicted. A groundbreaking approach, this handbook discusses powerful intervention practices to help youths with ADHD break through barriers and succeed in their lives. 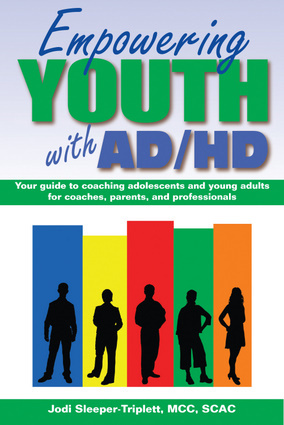 The thorough, hands-on guidance makes for an ideal resource for all individuals interested in learning more about coaching young people with ADHD—including life coaches interested in expanding their practices to a new market; academic tutors and personal organizers wondering if they would like to become trained as an ADHD coach; and therapists, psychiatrists, and pediatricians confused about what ADHD coaches do. To be provided at a future date. The author plans to obtain professional endorsements from her strong network of respected AD/HD professionals, such as Patricia Quinn, M.D. (ADDVance.com and author of numerous books and articles on AD/HD); Kathleen Nadeau, Ph.D. (ADDVance and author of numerous books and articles on AD/HD); Teri-E Belf, MCC (Success Unlimited Network and author of Coaching with Spirit); Nancy Ratey, Ed.M., MCC (author of The Disorganized Mind); Luke Iorio, President, Institute for Professional Excellence in Coaching (iPEC); Chris Dendy, MS (speaker and author); Karen Boutelle (Director of Coaching, Landmark College); Linda Petersen, Ph.D. (Huntington Learning Center); Ann Dolin, M.A. (Educational Connections); Laurie Dietzel, Ph.D. (co-author of Late, Lost & Unprepared); and/or Sharon Weiss, M.Ed. (author of From Chaos to Calm). Jodi Sleeper-Triplett is a master and senior certified ADHD coach and the president of JST Coaching, LLC, a company designed to provide coaches with the tools to serve the needs of youth. She lives in Herndon, Virgina.